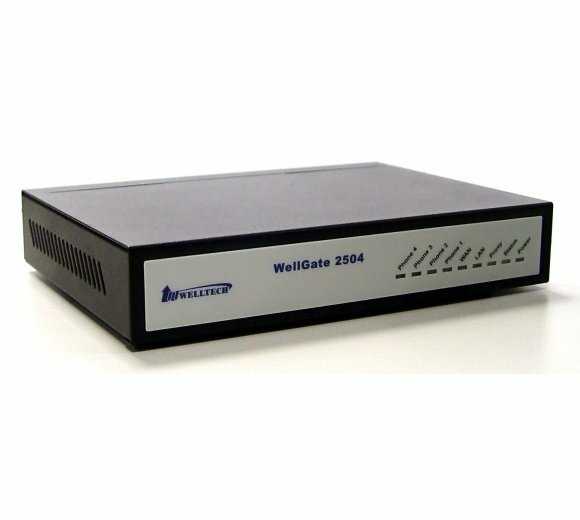 WellGate 2504 is an 4-line FXS gateway with SIP protocol IP device which allows to connect 4 sets of analog telephone sets to make or receive VoIP call over Internet or VPN network through Internet Telephony service provider. This device is suitable for office user through ITSP service provider to install at office or branch office to call between different offices. It also can install at trunk line in front of digital PBX to migrate digital PBX to IP Telephony call. WellGate 2504 is appropriate to use four VoIP Service Providers, IP Centrex service and IP-PBX within offices and remote branch offices. One of four SIP Servers ( or ITSP Service provider or alternative IP-PBX ) can be configured freely at each line ( FXS port ) to make or receive IP Call. It provides 4 service platforms to select lowest rate according to your dial number or country. IPv6 address was developed for years, however, it was not practical to our life up to date. More and more electronic devices are able to link to IP Network, this makes existing IPv4 address supply in shortage to global market. Meanwhile, the emerging countries are not able to increase IPv4 address supply due to strong market demand on broadband services. 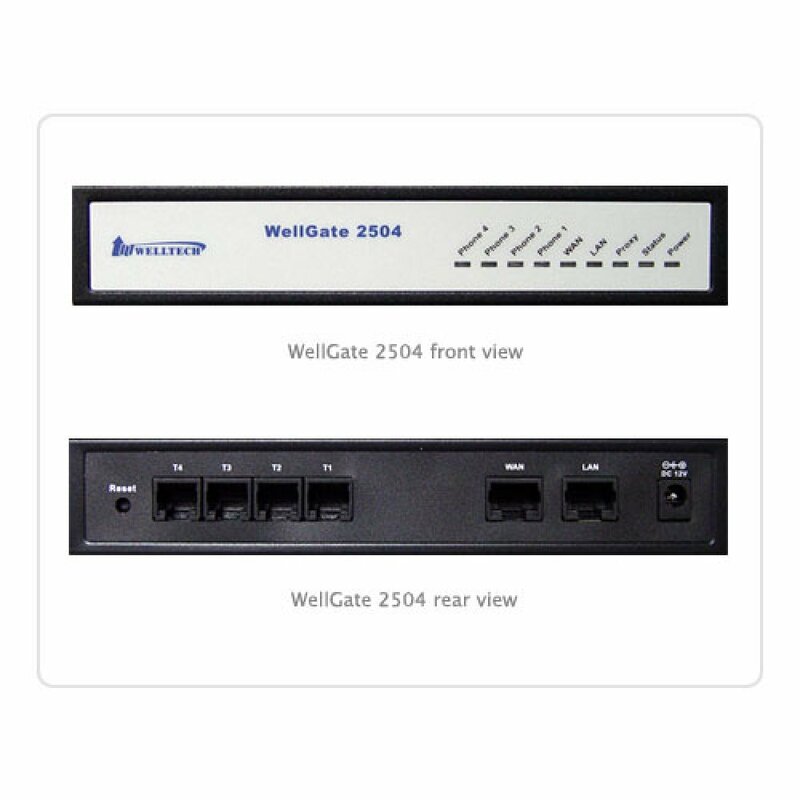 WellGate 2504 is an SIP based FXS gateway which built-in both IPv6 and IPv4 IP address. No matter when you are ready to deploy IPv6 network now, or reserve the future expansion to IPv6 from existing IPv4 address, WellGate2504 is ready to grow up with you. Both IPv6 and IPv4 address are working simultaneously at Voice IP Call. Its flexibility of both IPv6 and IPv4 accept and interwork both addresses on today and tomorrow whenever you need. 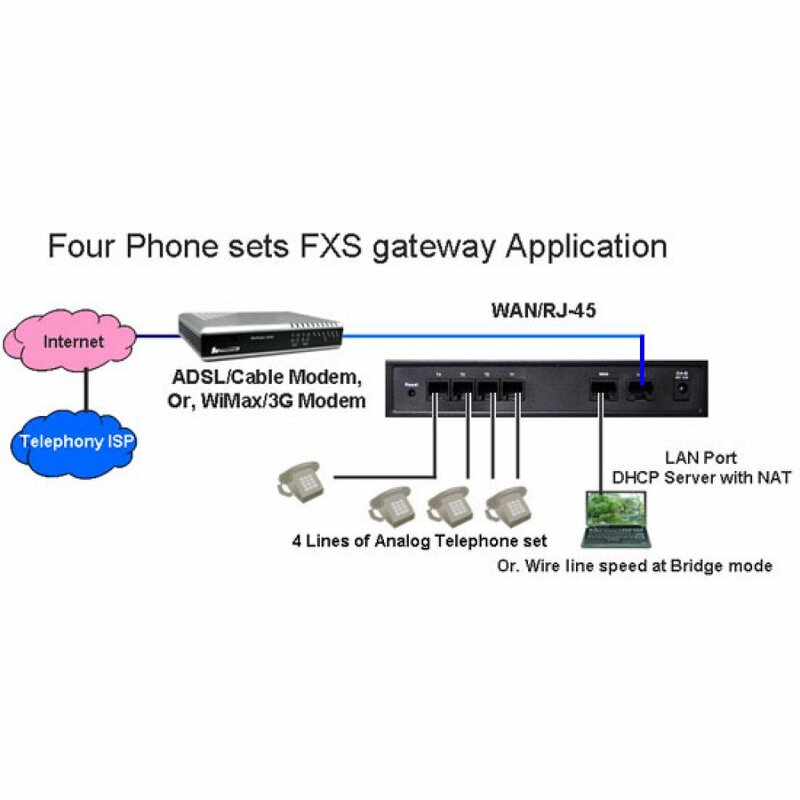 WellGate 2504 provides flexible Dial Plan from FXS to IP Trunk (SIP Softswitch). Dial Plan is to configure in what condition the digits can be sent out to IP network. The dial inter digit time before dialing is configurable to meet busy users or home user. Dial Rule is able to detect the prefix code and maximum digits reached and then dial automatically. The Digit Manipulation (DM) allows you to configure matched prefix code, digits length, start and stop digit position to be replaced digits as well. Route Plan is to configure the incoming and outgoing call routes which you desired this call to go out or allow to income. 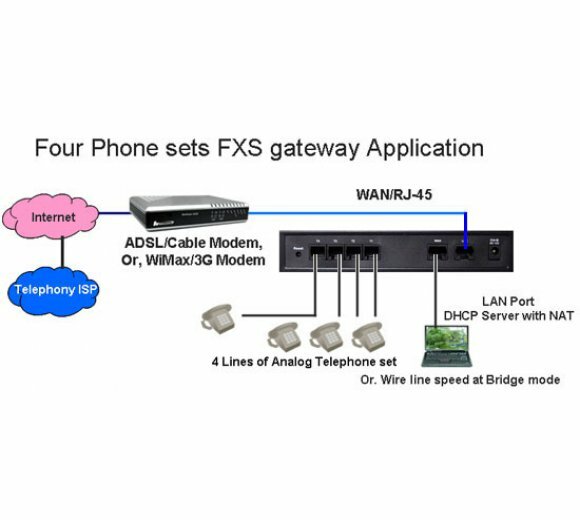 For instance, IP incoming call may Ring to FXS port with Priority, Cyclic or Simultaneously ring . You can also configure IP incoming call by Matched prefix digits, Matched incoming FXS line number and Matched digit length. For FXS outgoing call routes, the hunting type supports Priority, Cyclic or Simultaneously ring and select which SIP trunk ( SIP Proxy Server ) to go. FXS outgoing call routes also support by Matched prefix digits, Matched incoming FXS line number and Matched digit length. Both direction supports No Answer time out and Backup Routes. 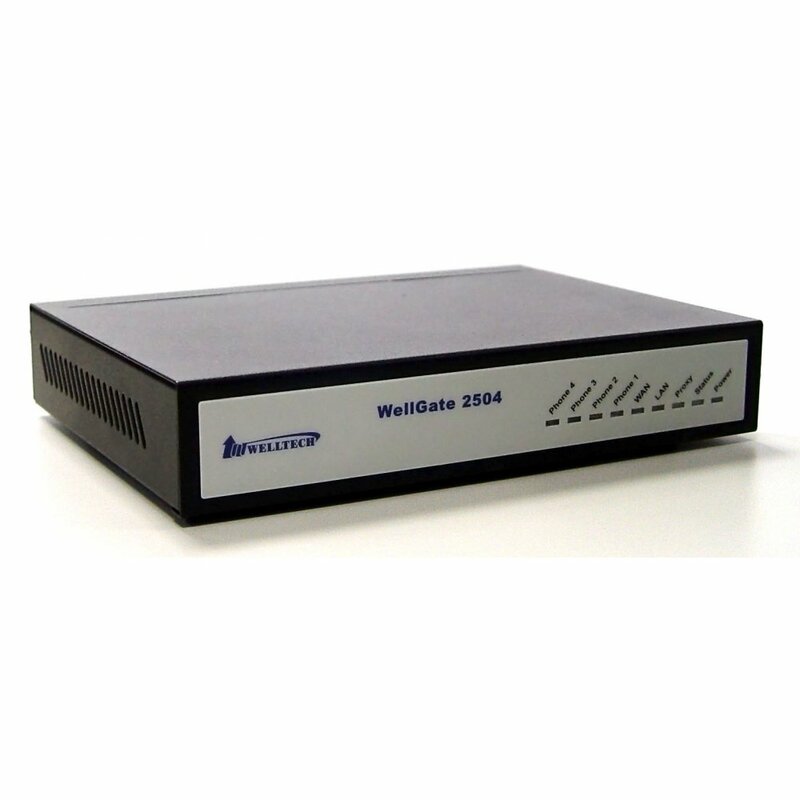 WellGate 2504 is a SIP IP device to connect with existing analog telephone set to make IP call. Its compact design and easy installation allow office user or single user to make or receive call just like an legend telephone call but less cost. It is compatible with broadband internet service device such as ADSL/Cable Modem and LTE/WiMax/3G Modem. It helps ISP provider to provide Telephony service to existing customer without additional cable. Welltech?s all products are 100% compatible with 3CX phone system including new model 32-FXS gateway (WellGate 3232s) and ATA172plus-PoE (2-FXS ATA with PoE interface). At this moment, ATA172plus-PoE can?t support 3CX?s auto provision feature which provided from 3CX?s server. However, you still can enter webpage of ATA172plus to configure parameters in order to link to 3CX phone system. It?s not a big issue to do that. 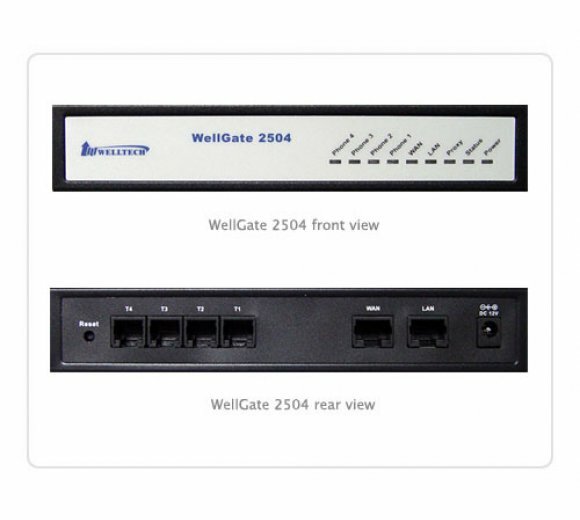 WellGate 3232s has the same design as WellGate 2504 (4-FXS gateway), WellGate 2540 (4-FXO gateway) and WellGate 2424S (24-FXS gateway). 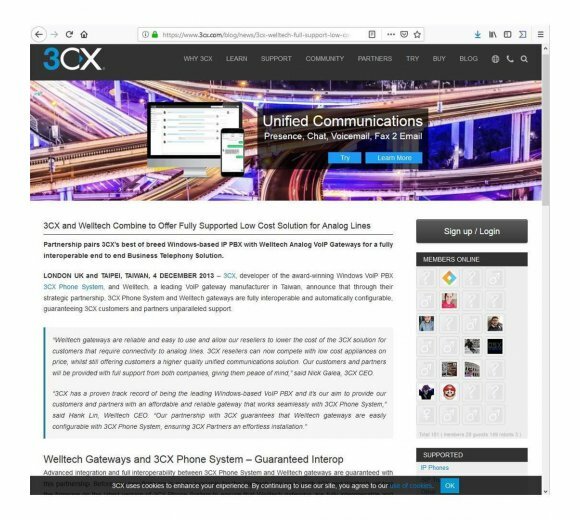 Therefore, you can use 3CX?s to configure these models. 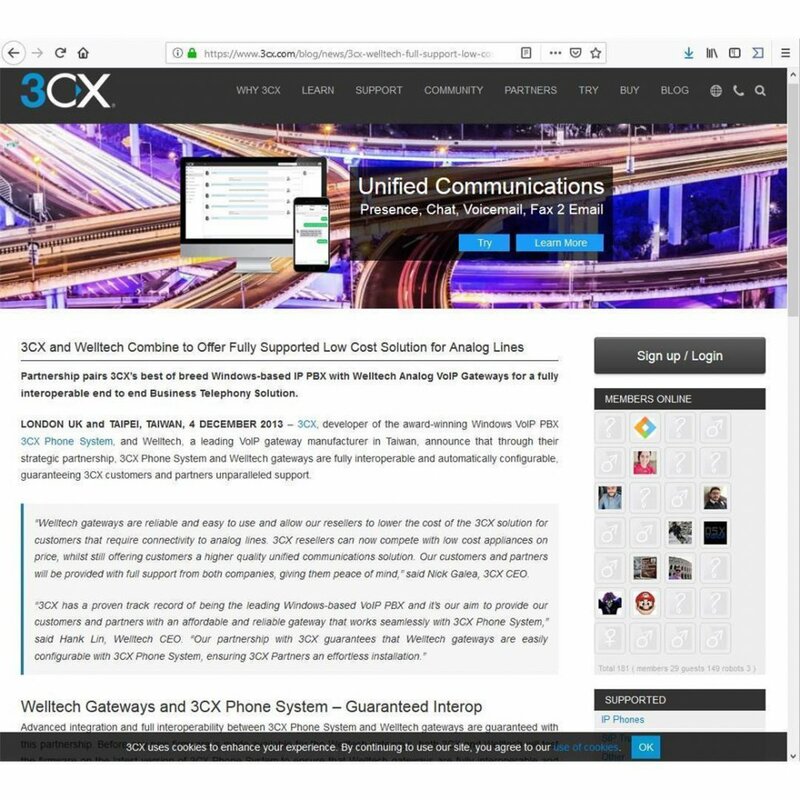 Welltech working with 3CX?s technical support engineer from headquarter to post WellGate 3232s auto provision file at 3CX?s tech support web very soon (current status 11.11.2016).